Notes: Samson's rugged equipment racks are solid steel and feature fully enclosed steel side panels. The racks are set upon 4 x heavy-duty, 3" (75mm) casters with locking fronts. Each Samson equipment rack includes a single-space, flanged blank panel. The truly innovative thing is that the unique steel support bar construction allows the racks to be assembled to accept either the European or US thread sizes. 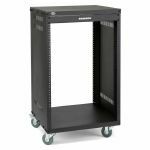 Notes: Samson's rugged equipment racks are solid steel and feature fully enclosed steel side panels. They are available in four sizes: 8-space (SRK8), 12-space (SRK12), 16-space (SRK16) and 21-space (SRK21). The racks are set upon 4 heavy-duty, 3-inch (75 mm) casters with locking fronts. Each Samson equipment rack includes a single-space, flanged blank panel. The truly innovative thing is that the unique steel support bar construction allows the racks to be assembled to accept either the European or US thread sizes.